It seems every day has a special day now, a great marketing activity for spreading a meme. I happen to like this one, so I am going to spread it. 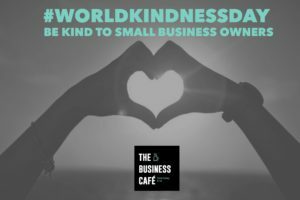 Today’s thought is therefore about Kindness in Business. Especially kindness towards the bravest business people in any economy, the small business. On Friday evening, oblivious that kindness had a ‘day’, I spoke about how important kindness is in business in my after dinner talk at the Women Leaders Awards in Peterborough. I shared my journey in business and how I didn’t fit in the business world in the 1980’s, as a women, I wasn’t the ball breaking, shoulder pad wearing ambitious women, but I was ambitious. Hard to articulate in my 20’s, it was just a burning inside me and a set of values that I wanted to live by and be surround myself with. It was a great relief to me in 2002 when my values were given a commercial currency. Business people were emerging online through social networks and the values I had shared within my business community, Ecademy, were becoming the norm, the kind people were winning business, being liked, and their personal brand was having an impact on their business results. Knowing our personal values and being brave enough to live by them and keep out the influences in life that attempt to drag us this way and that way is a critical component of happiness. Seems like these are great qualities if we can take the time to live by them, walk down the road, sit in meetings, when out shopping and towards anyone we meet in business. Our clients, our suppliers, colleagues and networks. I guess kindness needs empathy, the ability to sense what the other person needs at a given time, and then requires deep skills in listening and observation. All of this takes time, with our rushing hearts, packed diaries, chasing our dreams, and seeking revenue to achieve that peace of mind we all think will then enable us to have ‘time’ to be kind. Perhaps today, on World Kindness Day we can just look for the tiniest moments to give the kind smile, the gentle word, the patience we want others to give us. Kindness forms a bond, a memory and it gives energy out to the universe. Building this into out business values must be a good thing. We all seek the same thing, to feel we matter. I can’t think of anything that makes me feel more relevant in the world than a kind act towards me, so that is my personal focus for you all today. I hope I can have the opportunity to be kind to as many people as possible, always, but especially today.